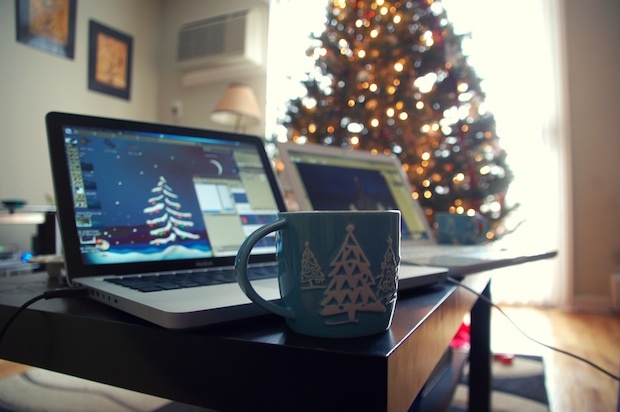 This Mac setup scene depicts what many of us will be doing this weekend; lounging around the Christmas tree with a warm drink and some Apple gear. On the left looks like a MacBook Pro 13″ and the right appears to be a white MacBook, both in the holiday spirit. I came across this great picture on Flickr while searching Google Images for a Christmas themed desktop picture and had to post it. It looks more like a late 2008 Aluminium MacBook to me. You can just about see there’s no pro wording at the base of the screen. Nice pic though. Merry Christmas! Ya you are right. This looks just like my Macbook. Also MacBook Pros of this style have the SD card slot on the side, too, which this one does not. MacBook aluminum and MacBook unibody I do believe. Looks like my evening right now! How do i know that it is a MacBook Pro 13′? The size of the speakers aside of keyboard. The 13 doesn’t have visible speaker grilles to either side of the keyboard. It’s the easiest way to tell the size unless you know already. If you want a copy, they’re running a promo right now. Use code Holidays2011 and save ten bucks.